Discussion in 'Bugs' started by MissingNo2, Aug 1, 2013. This here is a thread for pointing out any graphical oversights so they can easily be checked and fixed. For later notifications, I'll provide a brief description as well as a hotlink to the post in question. Any on this list that are crossed out are definitely fixed. I find it hard to believe you are really that bothered by these small things. Believe me, I find it hard to believe myself too when it comes to this stuff. I just find myself nitpicking a lot of the time. I I played around with trying to get the SML2 Bowser to walk around properly, and the way he is now is the best I could come up with based on Bowser's walk cycle. Was there something wrong with the setup I had when I made adjustments? I based it off of the SMAS SMB1 walk cycle. I didn't actually use yours. I'm pretty sure I had already made the change by the time you posted yours. I think MissingNo was just pointing out small details for the sake of accuracy, and not to shove it in your face or anything. TheomanZero and MissingNo2 like this. I noticed the tweaks, and in the meantime also noticed this. are you talking about the red lines above the water and the sides of the pipe? or the green orbs in the wall? The green orbs are supposed to be there I think. Both, and the orbs are supposed to be white. What? How did that room get like that? I know I had it set up differently. Argh, a stupid palette issue, one I hadn't seen for a while. Why didn't I get an error? The SMBS palette is a bit tricky sometimes because the colors all use max values. The problem with that, however, is that we use max value colors in our palettes as indicators to the game for what we want it to do with the colors. So, I had to use some slightly lower color values, but still high enough to be high contrast. Sometimes the palettes mess up and the indicator colors take on the lower values, then it doesn't work. Not sure why I didn't get an error, though. I have it set up to return an error in such cases. uglyrodent and Alkerion like this. Nobody is trying to be insulting or complaining, they're trying to help. But yeah, issues should continue to be reported individually. I don't think we need a general "Graphical Nitpicks" thread. These are all small oversights or errors that should be reported on their own. It honestly feels like needless clutter, but whatever floats your goat. Here's a nitpick: why does everyone go into the middle door of the X-3 castle? 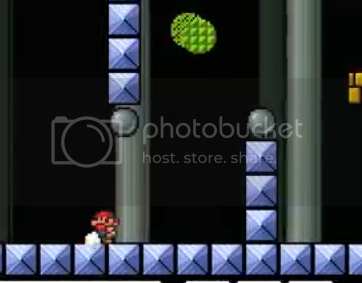 in SMB, mario went into the left door. Here's a nitpick: why does everyone go into the middle door of the X-3 castle? For better-looking skinned castles. Also All-Stars. CowboyJoseph64, huang17, ThomasMink and 2 others like this. The first and second smoke frames are switched from what they should be, and all of them are flipped horizontally. The Podoboo's splash does not use the actual graphics from SMW. The fireworks could be based on those from the ending. The castle skin does not actually use their respective moving platforms from SMW. Bowser could use Ludwig's fireball. The scale platforms' wire corners are not animated. Like I said elsewhere, the hammer could be the one from one of the castle destruction cutscenes. huang17 and Alkerion like this. I used an emulator slowed down and grabbed the smoke frame-by-frame. Technically, the smoke actually uses more frames than Mario's sheet allows for, so I just used four of them. It should be correct, though. The Podoboo's splash isn't even implemented yet. I can look into the graphics, though. I can look into the fireworks from the ending. I looked through all the castle and fortress maps and I couldn't find what you mean. Also, if you mean a different moving platform for each castle, that's not possible given that all the castles use the same theme, they are just recolored. I could probably use Ludwig's fireball. I'm not entirely sure why I'm not already, actually. The pully lift corners aren't animated because it's currently not possible to animate them. I may make them animated in the future. I actually already changed this. I saw the suggestion elsewhere and thought it was a good idea. It'll be in the game next update. Not really a "moving plaform" per se, but a sprite platform. I was thinking of the brown buoyant platforms from Lemmy's castle. Ah, okay, I did see those, but I think they're a bit bulky for moving platform purposes. Also, I tested out Ludwig's fire breath, and it surprisingly didn't look very good. I wasn't able to get it to animate properly, but it also looked a bit bulky and awkward. I just watched a video of SMAS SMB3, and the Rotodisc centers do have outlines. Ah, cool, I must have grabbed the screen when the background was black... Thanks! 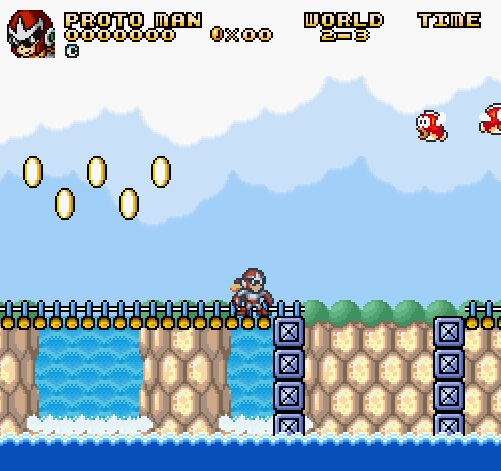 On one of the skins on world 2-3 (I believe SMW), there is a bridge with a fence which is a little too long. I'll edit this when I have a screen shot. EDIT: The error is on every skin. I know it looks weird, but that's actually in the original game. I had to double-check the maps because I didn't think it looked right, but there it was. Alkerion and Frozsoul like this.